We look at coastal stays in NSW where you can wake up with the whales, from Byron Bay to Eden. 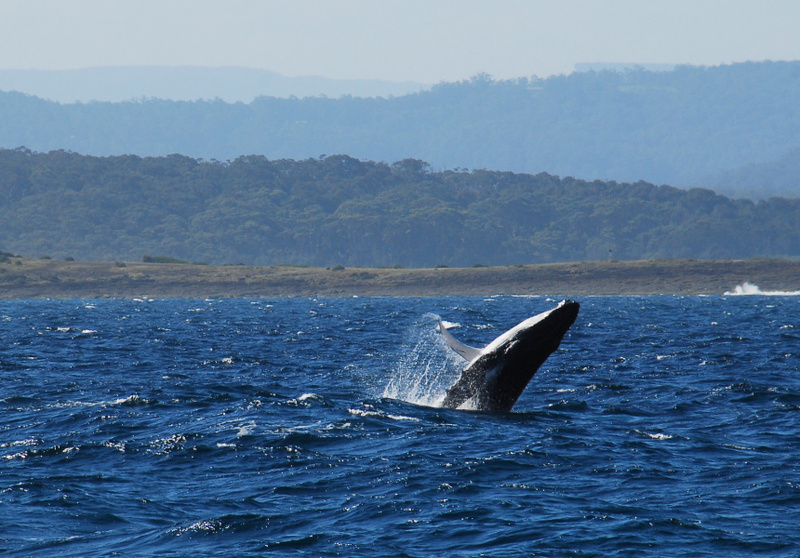 From May to November the eastern coast of NSW becomes whale-watching ground. Humpback and Southern Right whales are the most common type seen, breaching and lobtailing their way along migratory waters up and down the state’s coast. Some of the best vantage points to see the whales from are lighthouses, many of which offer the restored cottages and quarters of past keepers as boutique accommodation. Striking buildings in marine blue and seashell white, they offer uninhibited views of the ocean from their fire-place-warmed living rooms. 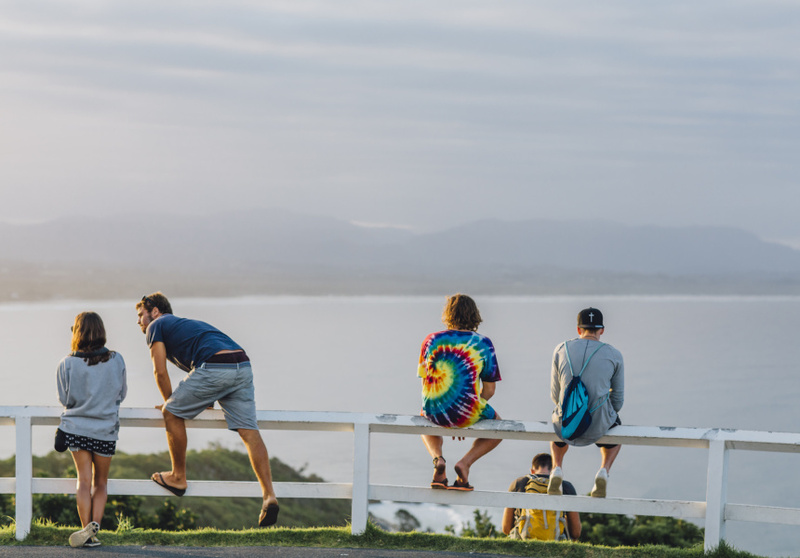 A walk up to Byron Bay’s iconic lighthouse is a ritual for most visitors, but not many know you can actually spend the night there. 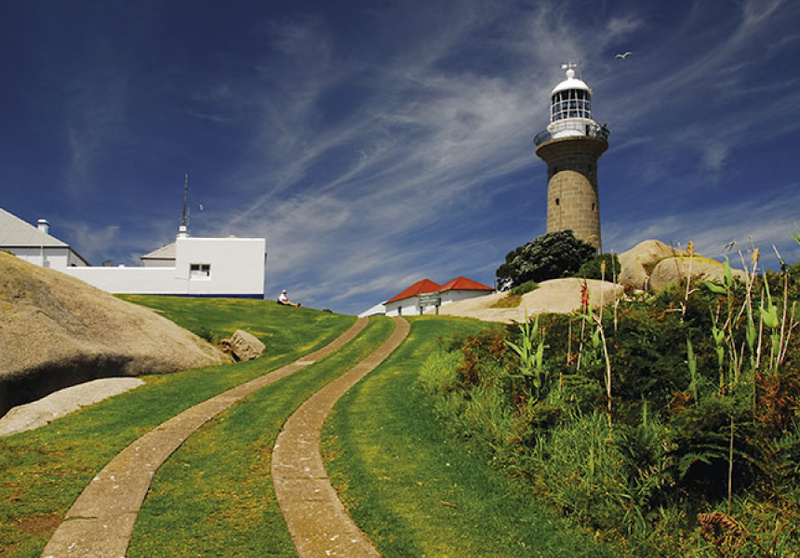 Situated on the tip of the headland – the most easterly point in Australia – these restored lighthouse cottages have panoramic views of golden beaches and, hopefully, whales. 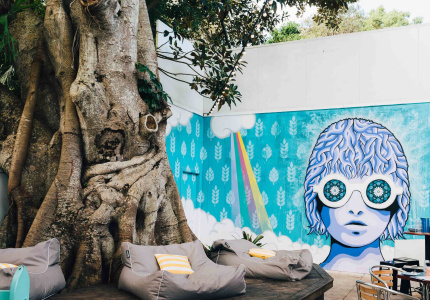 Staying in Byron means there’s plenty to see, do and eat. Breakfast at Folk, lunch at Bayleaf, Dinner at Rae’s on Wategos and cocktails at The Roadhouse. Whale season special: Book a stay between June 1 to November 30 to save 25 per cent. Minimum three nights. Sugarloaf Point Lighthouse Keeper’s Cottages in Myall Lakes National Park there are three of these restored lighthouse keeper’s cottages to stay in, each offering access to a long, empty surf beach and uninterrupted ocean views. Just outside of Seal Rocks and perched on the eastern edge of Myall Lakes National Park, the cottages are excellent vantage points for viewing whales, so you won’t have to brave cold winds to a lookout. Drive 20 minutes north to Frothy Coffee Boatshed on Smiths Lake for Lunch. The menu includes good, no-fuss options and the coffee is indeed frothy, but you’re really here to sit afloat the lake and take in the view. Whale season special: Book a midweek stay and you'll receive one of three packages to enhance your stay. 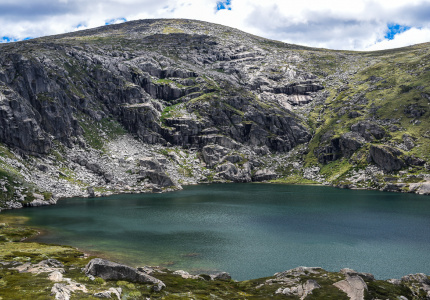 If you’re up for some winter camping by the fire, then Booderee National Park has three campgrounds: Green Patch, Bristol Point and Cave Beach. If you prefer the glamping option, Paperbark Camp is slightly further inland in Woollamia. 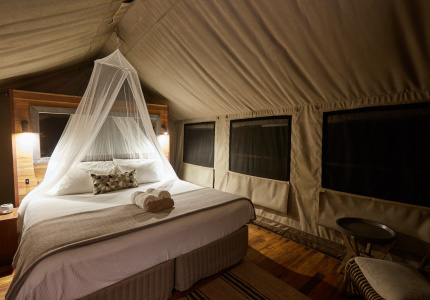 Here you can stay in luxury safari tents complete with ensuite bathtubs and dinner at its treetop restaurant, The Gunyah. Dolphin Watch Cruises in nearby Huskisson runs whale-watching cruises from May to November that have a pretty high sighting rate. So if you’d rather get closer to the action, head out into the calm, sheltered waters of the bay. Whale season special: Jervis Bay Wild will be offering whale watching tours over a several important dates in the 2017 calendar. Book your tour in advance here. Sitting nine kilometres off Narooma and accessible by boat only, this heritage lighthouse keeper’s cottage on the wilderness sanctuary of Montague Island Nature Reserve is the only accommodation on the island, so come night time it’s a pretty remarkable experience. Montague Island is home to the largest colony of little penguins (also known as fairy penguins) and fur seals in NSW. Seals are generally easy to see, because they laze about during the day. If you have a torch you might have some luck seeing the penguins returning to shore at dusk; watching them launch their slippery selves ashore is very cute and endlessly entertaining. Whale season special: between May 1st and November 30th , book for three nights for the price of two. More information here. Not far from the historic whaling town of Eden, this lighthouse at the tip of Green Cape is probably the best whale-watching point in NSW. The southernmost lighthouse in New South Wales and Australia’s first lighthouse to be built in concrete, it has seen countless rescues and shipwrecks in the surrounding Disaster Bay. 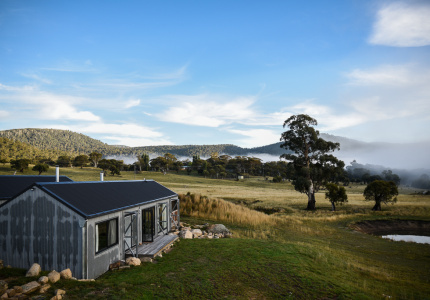 Set high on rugged cliffs, these remote cottages have cosy open fireplaces. You’ll be far away from any phone reception here, so this is ideal for a weekend away spent cooking and playing board games. This is mecca for whale aficionados. Because Eden’s Twofold Bay is the third-deepest natural harbour in the Southern Hemisphere, it hosts an abundance of humpback, southern right and killer whales throughout the season. 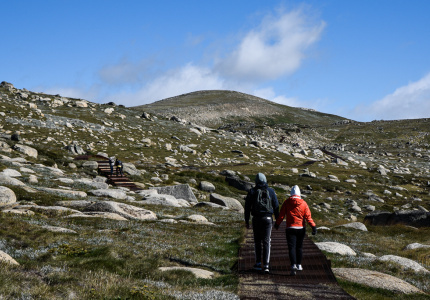 Eden has a long history with whales and the town boasts a Killer Whale Museum (they sound a siren from the museum when whales are sighted) and a Killer Whale Trail, a self-drive day tour that explores the whaling history of the Sapphire Coast. If your trip falls in October or November you can attend the Eden Whale Festival, a weekend-long celebration complete with live music, a street parade and fireworks. Whale season special: between June 1st and August 31st, you can book a three nights stay for the price of two. More information here.